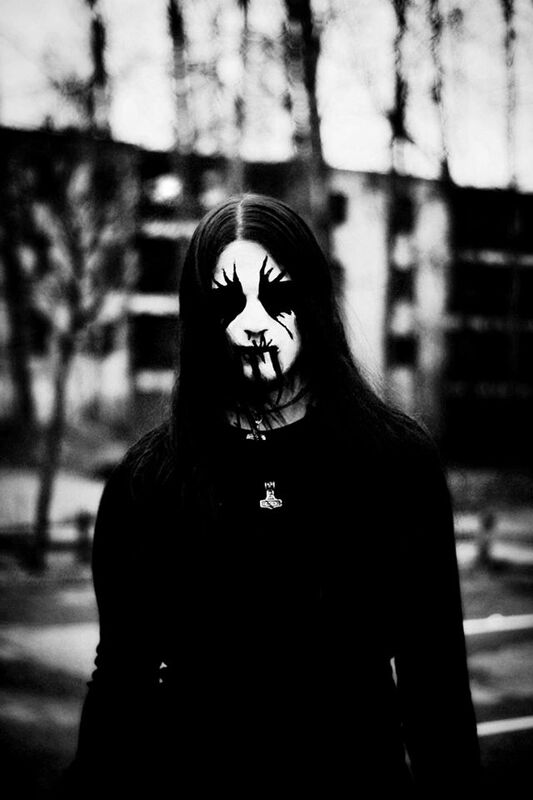 Coldbound is a one-man Doom/Black Metal band from Finland. In 2012 he came out with the first EP ‘’ Banner Of Stormy Welkin’’ Later in 2013, a full-length album entitled ‘’ Constellation Of Dawn’’ was out and this received good reviews from listeners. Beside the albums, Råbjørn tried some covers of the Norwegian black metal band Taake, which were recorded and set up for the 2014 album. At the moment, Coldbound is preparing a new album, this time with instrumental songs and new members in. Tell me a little history about Coldbound. Paul: Well I started by myself Coldbound around 2012 …did a few songs but never thought I would release them so after one year ( 2013 ) I just recorded a few more songs and I released the first full length. So far in my 2 EP’S and 2 full length releases I never published lyrics, as songs are connected with some of my personal struggles. Now I am moving on and I closed down the chapter I and II. Coldbound now is me and 2 other friends that are helping me with the new release on additional vocals and on keyboards. What I found and listened to are also covers of Taake songs, right? Can you tell me some things about the 2 EP’s? Paul: Absolutelly right, I did a (Bad) cover on nattestid pt.I . For the record I dont like any of my releases so far but the new release is going to be the best up to date. First EP is a sh*t. All the songs I have been recording during 2012-2013 and the second EP is actually an experiment on a new approach for Coldbound, recorded a song(superior lakes of sorrow) which was doom and symphonic at the same time, covered Burzum’s song and one of my very first songs also “(In the eye of the blizzard). Why do you think these 2 were that bad? I mean at the begining could be as demos. Paul: Something was missing . Or something was way too much. Something doesnt fit good in my ears, tho I read some reviews from both of my albums and people liked them hehe. I would never like to release demos. i am against releasing demos. Demos should remain inside the cores of the projects not being released. Have you decided as Coldbound to be a one person band? How do you record? Studio or home? Paul: It was not a decision, it came like that automatically since i didnt knew any person around with a will and strength to sit down and record proper stuff ,so I started recording by myself. You dont find easily persons around that are devoted to music. Its always a problem when people cant gather and jam music. So I started from the scratch only by myself. I consider in future to run this in full member band hopefully. I am not against any idea like that I have home studio equipment. thats how i record . You mentioned something about new stuff, tell me about it. Paul: well I am releasing a new album soon called “Rites Under Moonlight” . I recorded the main part of the songs during the winter moonlights between October and February . The result so far is satisfying my demands and I hope so will satisfy the listeners . The approach of Coldbound this time is quite unique since I try to make my own sound ,without being inspired by other bands. As you said ‚’inspired by other bands, something inspires you at all, some influences as bands/artists? Paul: Only thing that is inspiring me is the nature and mr.Øystein G. Brun (Borknagar/Cronian) for saying to me once that (gas and money run out, but inspiration never runs out). What are people saying about what you do. Do they like it? Paul: Well I suppose they do , from as many people I have asked so far. And I really appreciate that. You said that now you are not working alone, you got new members into the band. How are the recordings of the new material going? Paul: Yes exactly . Right now 2 friends are helping me , Andy on keyboards and Jasmin on additional female vocals. So far all the instrumental part from my part (guitars,bass,drums) are done. Some vocals are done also and only additional vocals remain and the keyboards. And we are done. Have you ever had shows with Coldbound? If yes, where did these take place? Paul: Oh not so far . Maybe some day yes…but this is not sure at all to say. I see and I am sure there would be concerts soon. It seems you are like Burzum, you record albums, but no shows, he he. Do you see a nice future with Coldbound? Paul: Hehe well luckily many people do the same, for example one of my favorite bands which is Cronian from Norway, they never had shows so far and they are 2 persons. Shows are nice of course but needs a lot of time to arrange that. I see a nice future as long as I do nice music…and thatswhat I try to do …make nice music. Are there any sites where people can purchase your albums and merch? Paul: Of course there is at the moment a page that I am selling my shirts and some other merch and a page that people can pre order the new album. And the last question, do you have a message for the people who are listening to your stuff? Paul: I would like to thank each one of you personally for supporting me and all my effort. It means the world to me and I hope that I will receive your support after the Rites Under Moonlight is released. For each one of you who is interested to see what is behind Coldbound, all informations are gathered here, also feel free to be in touch with me for any matter you might have. Thank you for your time Paul, it was a pleasure. All the best! Paul: Thank you so much Carla, hope you enjoyed it as much as I did! Previous PostVIDEO REVIEW: CAVE EVIL BOARD GAMENext PostMetal Icons W.A.S.P. Sign to Napalm Records New Album Set For Release This August!